Progress on the Museum entrance way: rock on! What’s going on? Lots! Click for a close-up. During the past week, we’ve watched a good bit of earthmoving, repairing and preparing the stream, its slopes, and the stream bed between the Museum parking lot and the Museum entrance. The preparation will permit us to install an ADA-compliant and future-flood-resistant path and bridge, as well as a riparian slope “garden”. While this is going on, please use the rear entrance (facing the road). We look forward to seeing you! This collage of photos was created by Elizabeth Spinney, copyright © 2015 and used by permission. 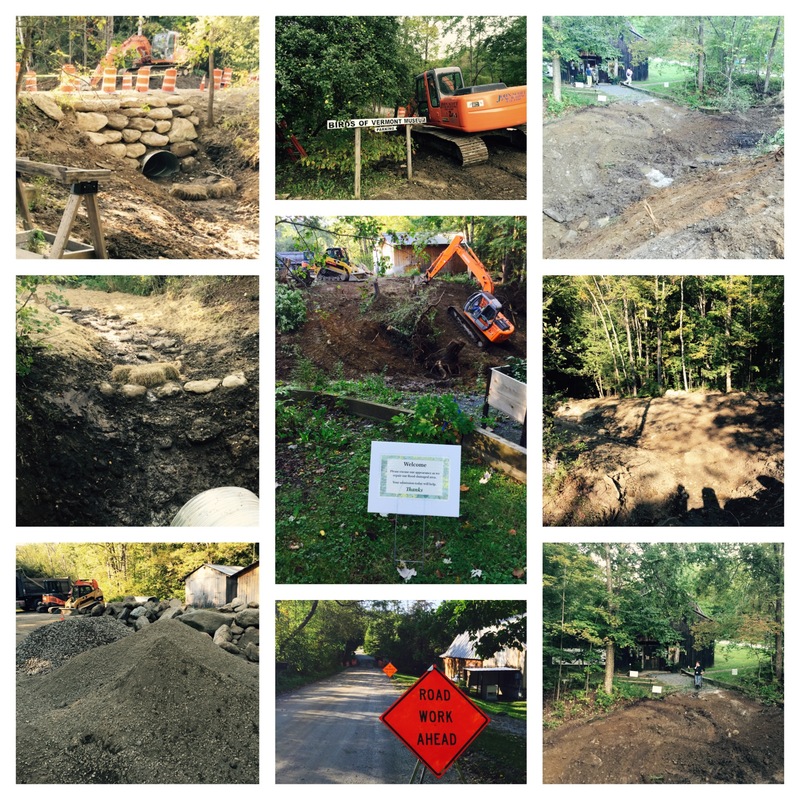 Thank you to Grover Engineering, the State of Vermont (VTRANS and DEC), and John Scott Excavating. Let us thank you! John Scott Excavating laid some beautiful boulders on the Museum side of the road, around and above the road culvert. Last week has seen a lot of changes outdoors at the Birds of Vermont Museum, between our front door and our parking lot, and along that section of Sherman Hollow Road. On Monday, September 14, the road culvert replacement started. 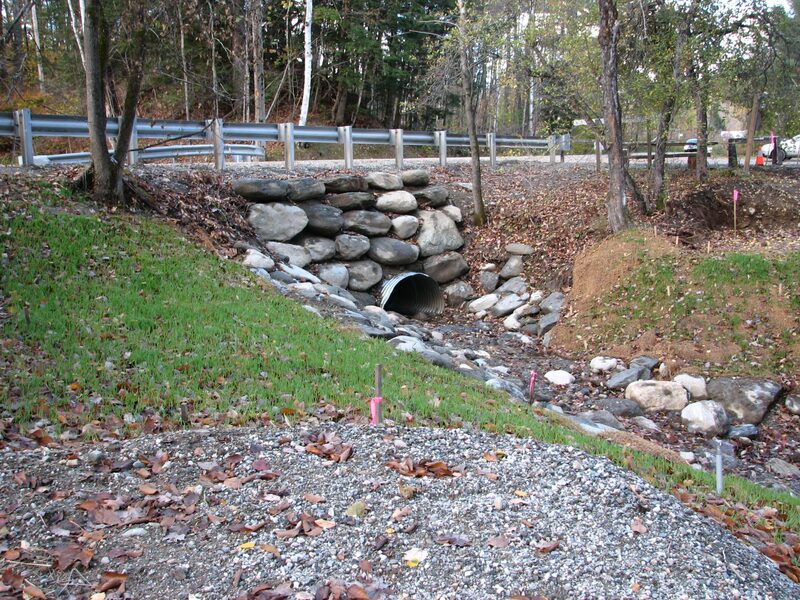 This one is deeper, and has a different profile, thereby protecting the stream hydrology and local wildlife more than a shallower, smaller, round culvert would. 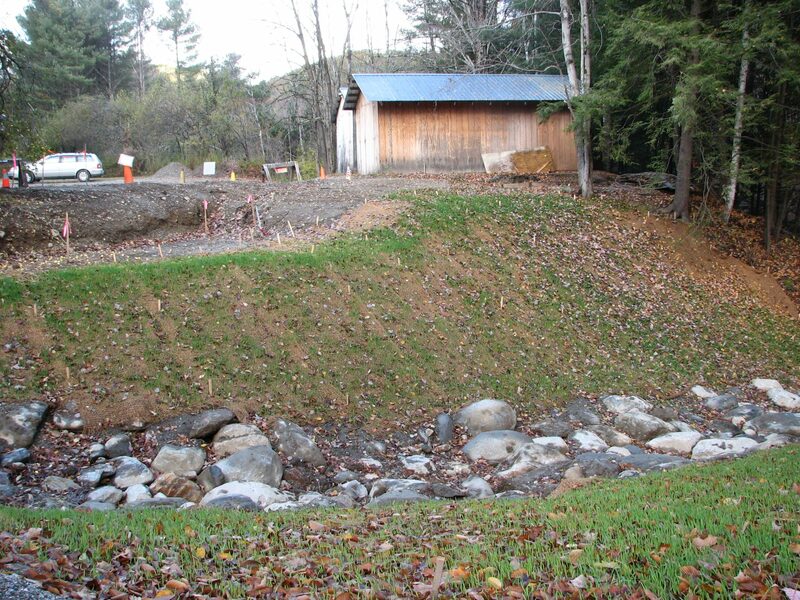 This one allows for increased water flow, which prevents erosion and sedimentation of the stream bed. The slight “squashed” shape keeps a better aquatic corridor for critters both in and near the stream. Since then, the excavation crew has been working both upstream and downstream. They have been installing rock and cement protection to stabilize the banks and installing a yard drain to collect stormwater runoff. So many thank yous to Grover Engineering, the State of Vermont (VTRANS and DEC), and John Scott Excavating. The Museum will be closed to visitors on Monday and Tuesday, September 14-15, while the Town replaces a culvert on Sherman Hollow Road. This is the next step in our Bridges to Birds project! 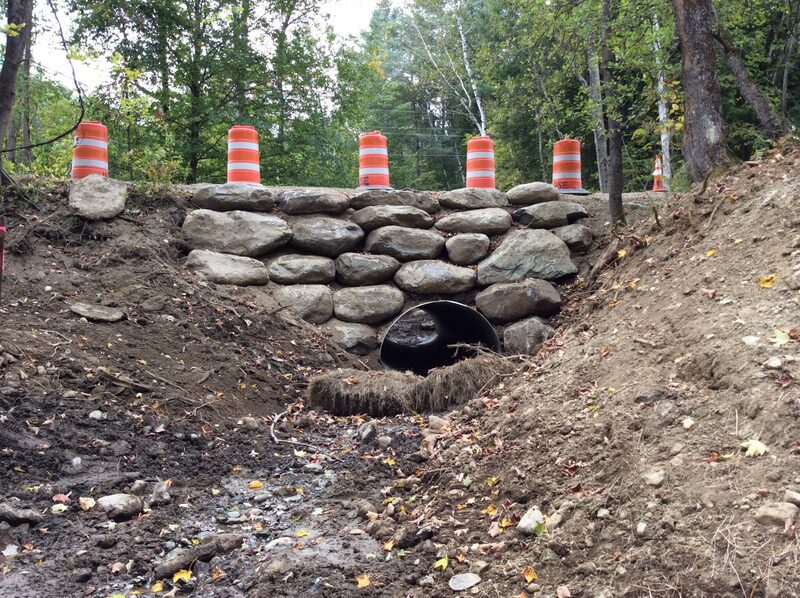 We will begin the stream bank restoration and entrance path/bridge when the culvert is in place. We can be reached by phone (802 434-2167) or email museum@birdsofvermont.org. The Board Meeting will still take place on Tuesday evening. 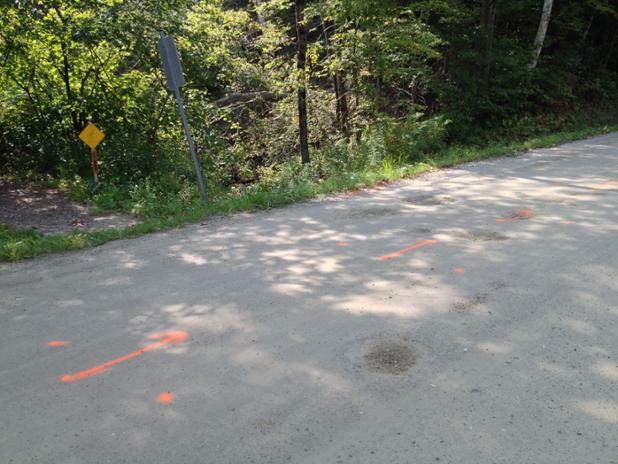 Spray paint markings to guide the road crew when they begin to replace the culvert. How shall we thank you? Let us count the ways! 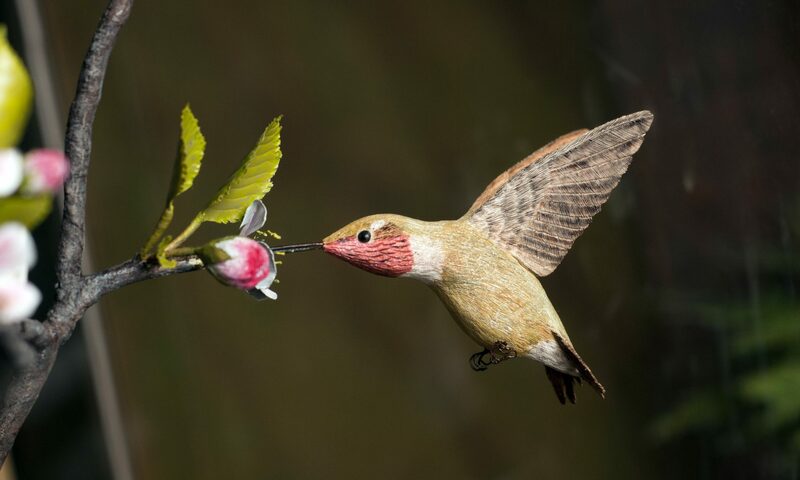 Each donor to our Bridges to Birds campaign may choose to receive a corresponding thank you gift from the Birds of Vermont Museum. Donations are cumulative; please call the Museum (802 434-2167) if you have questions about your donation history. Chickadees receive a bumper sticker and two (2) passes to the Museum. Blue Jays receive a set of 10 note cards of carvings and 2 passes to Museum. Cardinals receive a hand-carved Comfort Bird (from trees downed by the flood) and 2 passes to Museum. Nuthatches will have their names (or the names of those they wish to remember) included on a plaque mounted on or near our new bridge, plus a complete set of the previous gifts. The first twenty (20) Scarlet Tanagers will receive a framed print of Vermont artist Libby Davidson’s plein-air ‘Painting #5’, showing Sherman Hollow Brook, plus all the Nuthatch-level gifts. 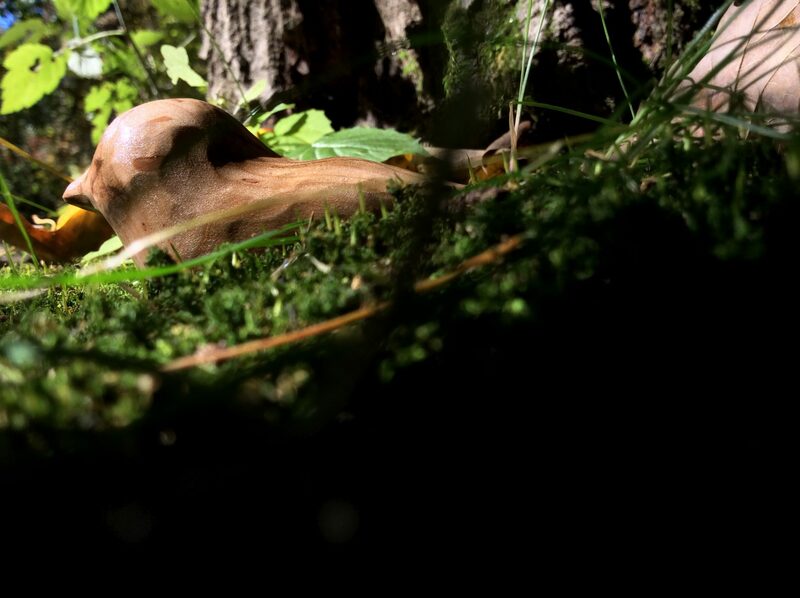 The first five(5) Hermit Thrushes will receive Dinner for Two in the Treehouse, plus the Nuthatch-level gifts. 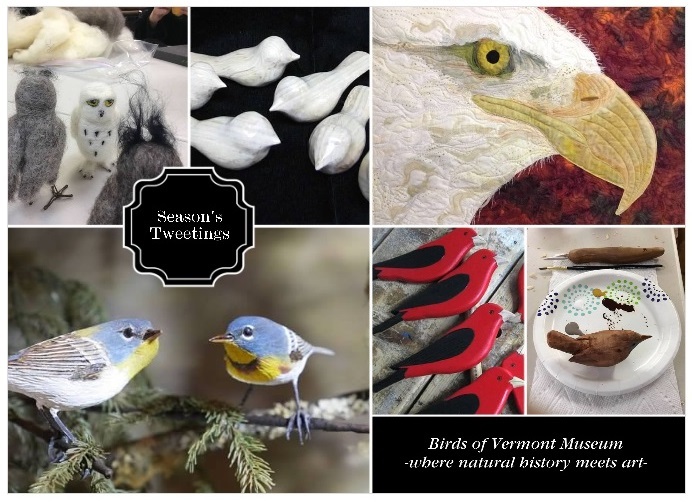 Peregrines receive a one-of-a-kind Vermont or bird-themed handcrafted wall-hanging by quilt artist Carol McDowell, plus the Nuthatch-level gifts. The Snowy Owl donor will have the opportunity to accompany Denver Holt of the Owl Research Institute for several days in one of two research locations. The Donor can choose to visit Alaska to see snowy owls, or Montana to see numerous other species of owls. Airfare, room and board are included if travel arrangements are made with the Museum. The Donor will also be recognized on our memorial plaque. Bridges to Birds incorporates disaster recovery, resilience, and prior long-term plans to make outdoor experiences at the Museum accessible to all visitors, including people with limited abilities and families with small children. This four-phase project also expands conservation and educational opportunities and increases the number of locations available for quiet appreciation and contemplation of the natural world. 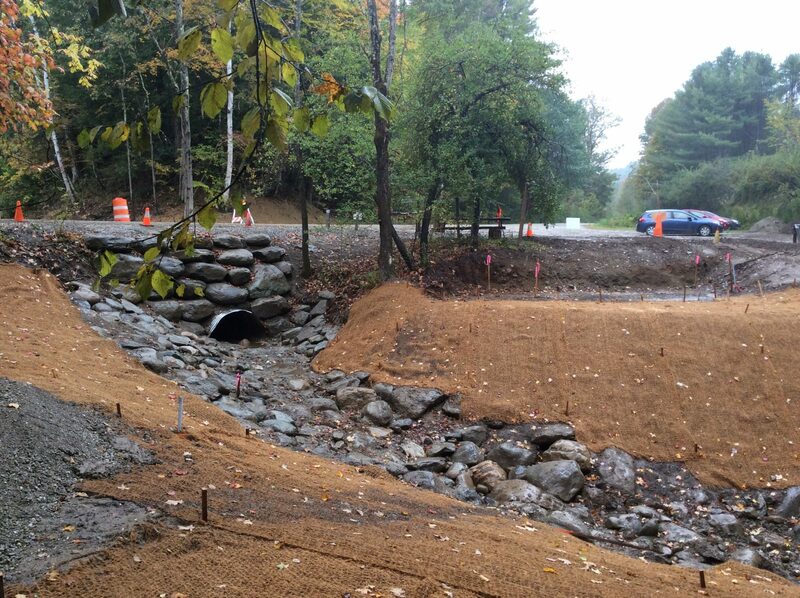 We are working with the State of Vermont, the Town of Huntington, and civil, structural, and hydrological engineers to design and build a bridge and walkway after installation of a larger culvert under the road. Interpretive signs, plantings, and welcome information will follow. Volunteers, staff, and interns repair trails, footbridges, and handrails. 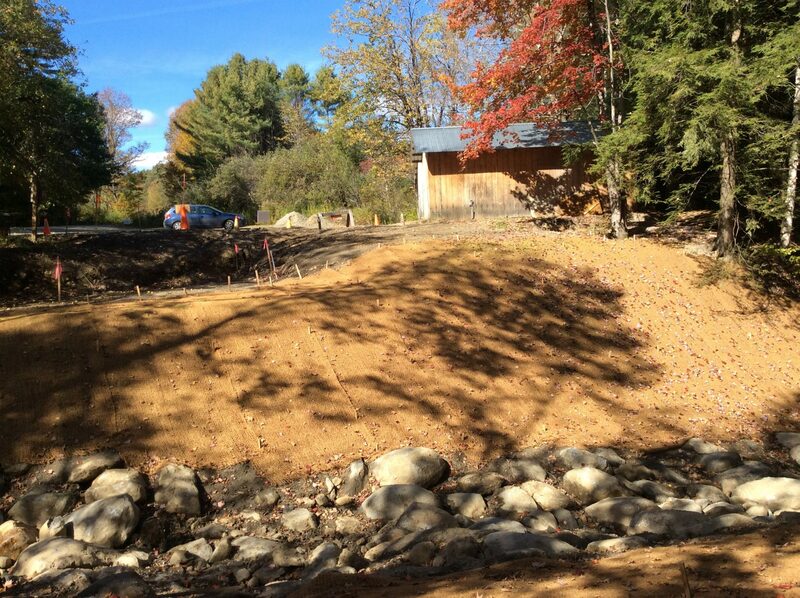 We continue to work routing water away from trails, and providing sturdy footing where needed. New maps, signage, and guide materials will be created. 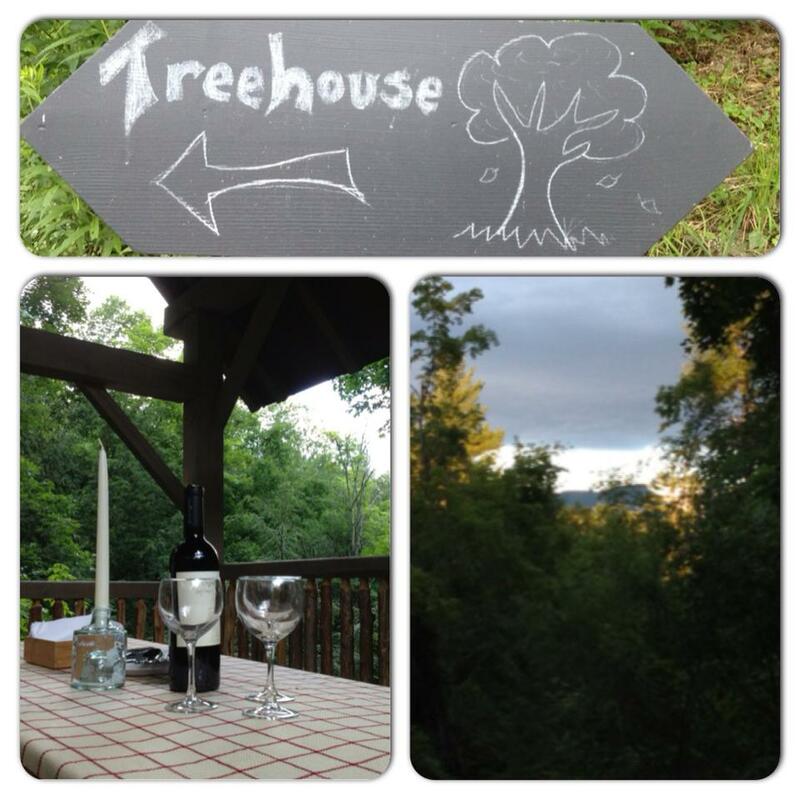 The treehouse is already open! We completed the construction thanks to a generous partnership with Center for Technology Essex, Evergreen Roofing, and dozens of volunteers. A grant from the Vermont Community Foundation helped with treehouse-specific programming. The last donations will fund educational signage and seating. The Gardens phase integrates previous work by staff, interns, and gardeners on local, bird-friendly plantings, garden layout, and native species. Garden beds, paths, booklets, informative signs, and short education tours all extend the experience. The Birds of Vermont Museum’s treehouse debuted one year ago, much to the delight of the Museum community. Constructed by the students and instructors at the Center for Technology, Essex, the new structure, tucked into the trees above Sherman Hollow Brook, has already proven its immense value as an observation deck and a learning lab. Children attending our Nestling’s Nook story hour and Fledglings Junior Birder programs have enjoyed the treehouse’s outdoor adventure atmosphere as they explore the connections birds have with the environment. Girl Scout troops from the Green and White Mountains Council incorporated the treehouse into their nature walks while participating in three special programs at the Museum this past year. School groups following our guiding questions packet ponder sensory input such as sight, sound, smell, and touch to develop an understanding of the elements of natural systems in their midst. Interpretive drawings of living and non-living components in the bird-filled habitat surrounding the treehouse help young people make connections within food webs and nutrient use and recycling. Many visitors to the treehouse linger over a picnic lunch as they take in the 360-degree view of life within the tree canopy. Bob and Gale enjoyed regular lunch dates there throughout last summer while connecting with the magic of the Birds of Vermont. Situated over the brook, the treehouse enables new and experienced birders to hear and glimpse birds which favor habitats featuring flowing water, such as the Louisiana Waterthrush. During the spring breeding season, Early Birders’ walks regularly finish at the treehouse for debriefing and bird chats. It’s been a joy to see how accessible and enlightening the treehouse is for our visitors; we look forward to new experiences in the coming days and months. We hope you will join us there too! Do you need a place to sit, feel the breeze across your face, see the clouds rolling across the sky, hear the brook cascading over rocks, listen to the sounds of birds singing, chirping, and calling to each other? If so, come visit the Museum’s new treehouse. Rain or shine, it’s waiting for you. This project really began years ago and would not have happened without the insights, connections, funds, labor, and services donated by Bob Spear, Gale Lawrence, Dann Van Der Vliet, Mae Mayville, Shirley Johnson, Becky Cozzens, Evergreen Roofing, and the Essex Rotary Club. 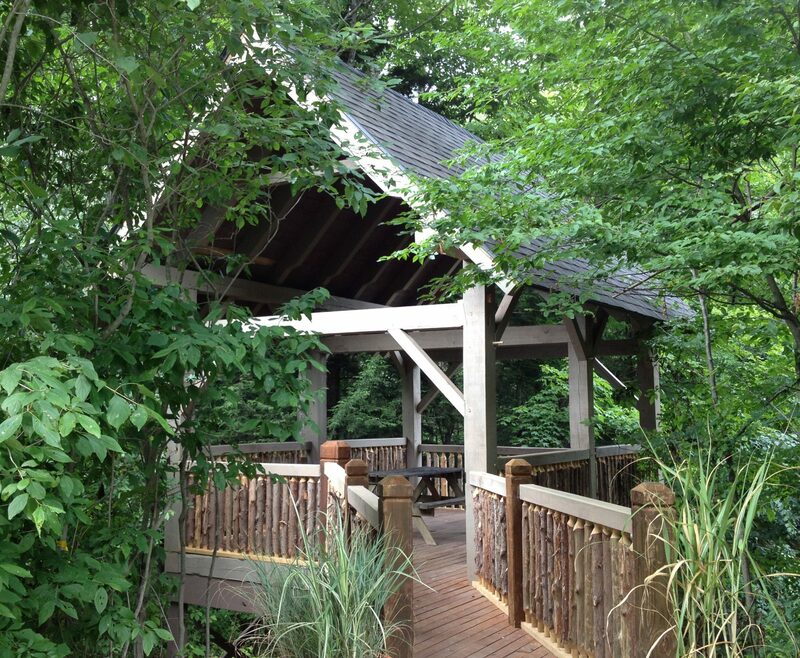 The treehouse itself and a wide walkway leading to it were built by the Center for Technology, Essex. The students, under the direction of their teachers, Shawn Rouleau and Brian Japp, designed, built, and installed an entire timber frame structure that is accessible to visitors of all ages. The students impressed us all with their skills and dedication. 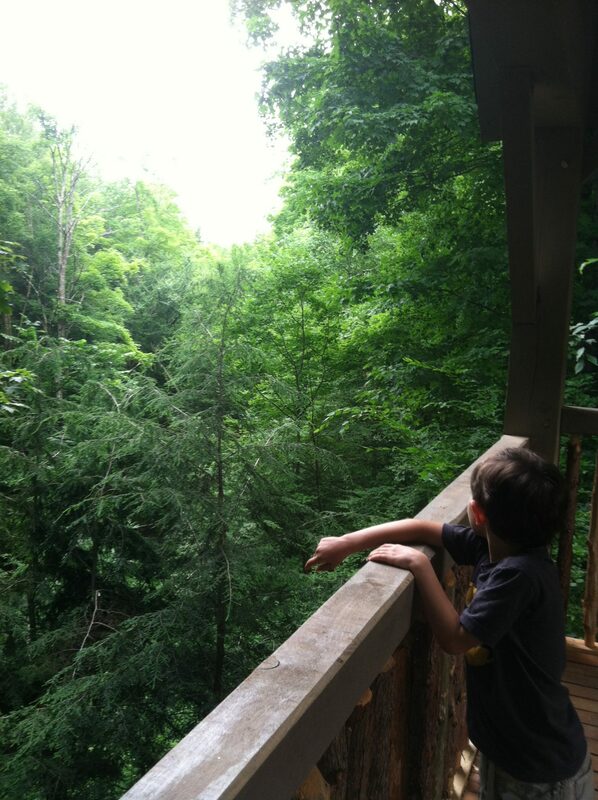 Our treehouse is built out over a long stream bank to allow for elevated points of view and unique listening opportunities. When weather and foliage permit, the peak of Camel’s Hump can be glimpsed above the trees. Sherman Hollow Brook tumbles below, often hidden, delighting the ear. Nearby hemlock, apple, and maple trees provide perching and gleaning territory for many small songbirds. The wide, nearly level gravel path to our “elevated bird blind” begins near the back lawn, winds through new garden beds, tucks behind the dogwoods, and meets a short bridgeway to the treehouse itself. The treehouse gives us an additional space with completely different perspectives, allowing new outdoor programming options. A recent grant from the Vermont Community Foundation’s Small and Inspiring program will help fund development of “Connections in the Canopy” activities and curricula. We thank all of you who helped bring this vision into reality and we hope everyone will come visit. It’s for you.